Two HOTAS or dual stick? HOTAS is a stick for one hand and full size throttle with buttons and switches for the other hand. You can use two HOTAS in dual stick configuration, but you might get more bang for your buck with the Thrustmaster throttle body on the off hand if you're using Thrustmaster. Buttons are a lot more accessible. For what it's worth, I use only 1 HOTAS and keyboard/mouse, or just keyboard/mouse. It's totally your preference. I recommend dual stick, This is what im running currently, with them mounted to my chair, but sitting on your desk would work too. I did a hack where you put a zip tie on the springs to soften them up some. What i liked was they came with a left & right w/o having to modify anything. Yep, t16000s, a pair of them. I started with them myself. Also used the zip tie mod to compress the right stick a bit to give it some more fluidity. As an intro to dual sticks, you can't beat the price. Later I moved to a warthog and then got a virpil for the left hand. Saving this for future use. Thanks! Currently i use two T16000m with voice attack. T16000 is imho a good stick, much more pricey sticks will probably give you a better experience. For Strafing the T16000m is good enough imho for very precise targeting you might want to switch to something with more and better buttons. 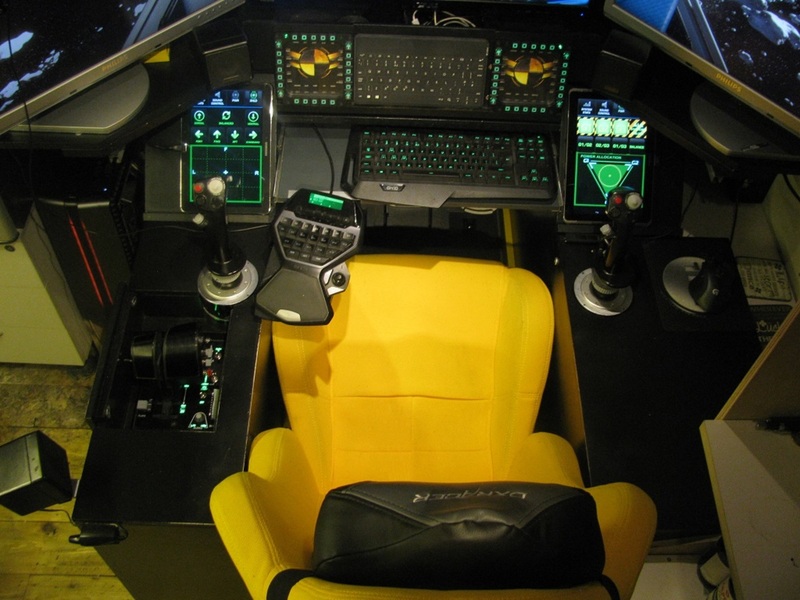 I'm not sure about the two Hotas thing if thats what you want, it might be useful to at least add one throttle. The idea behind HOTAS is Hand On Throttle And Stick. The T16000m is a good stick for dual stick dogfighting, but... https://en.wikipedia.org/wiki/HOTAS... imho it lacks a few buttons on top of the stick. for very precise targeting you might want to switch to something with more and better buttons. In order to use some advanced controls, like targeting, power control, shield control, you are forced to use the buttons on the base and take the hands of the shick or get a more advanced stick. Yeap, definitely get one throttle, with or without 2 sticks. With 2 sticks you might find it challenging to find a good spot for the throttle. DRUNKEN FLY ALL THE SHIPS! Don’t make the switch to dual stick, etc right now. With the new flight mode coming out at the end of March/early April, you should see how that impacts you and then make a change. I use dual HOTAS when I play. I have a stick for left and right hands, and I have a throttle for each foot. It's simple really. I have a throttle for each foot. It's simple really. You also roll with both feet? Nah, I use twist on the right stick for roll. Right one is strafe up and down and the left one is reserved for the in cockpit Big Benny's dispenser. Nah, I use twist on the right stick for roll. I use the left and right brake pedal from my rudder pedals as strafe forward and strafe backward. Technically it can be seen as throttle. You should, I know you're worried about the flight model changes but even that'll be tweaked over time and different ships will still have different flight profiles so it'll be good to get used to things changing. so it'll be good to get used to things changing. I may just wait a bit. Perhaps give the old xbox controller a try.